Review of Tangled Road Again! 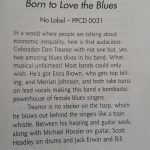 Listening to any of Dan Treanor’s music makes it quite obvious that he is as equally knowledgeable, as he is fond, of the history of the blues. As a matter of fact, just last year he was presented a Keeping The Blues Alive Award, in the Educational Category, for his work with the Blues In The Schools Program. 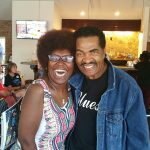 With a Masters Degree in American History; outstanding vocal, harp, guitar and songwriting skills; and the knowledge and love he has of this genre, this was easily a no brainer for the Blues Foundation. On “Tangled Road Again”, the latest in a long line of Dan Treanor releases, The Afrosippi Band consists of: Dan on harp, guitars, Khalam and vocals; Erica Brown on lead vocals; Michael Hossler on guitar, lap steel, gitjo and vocals; Mike Wysocki on bass and vocals; Gary LaDuke on drums and percussion; and Merriam Johnson on lead and backup vocals. Guest Afrosippians include: Lionel Young on Violin; John Magnie on accordion; Dan Haynes on organ; Chuck Smith on keyboards, and Gary Flori on percussion. The CD opens with the very intensely produced and presented title track, “Tangled Road”. As Dan’s narration goes: “Blues came from Africa a long time ago. Based in the African tradition of ring singing and call and response. Oldest kind of blues there is, it’s called a field holler or a work song”. With that said, Erica’s vocals – with some tremendous help on backup vocals – then transcends you right to the middle of that field. Bordering on bizarre, the culmination of the intense voices combined with the profound instrumentation and percussion create a near maddening effect. To say this was one hell of a moving song would be a severe understatement. “Hey Mister”, whatcha gonna do? shouts Erica on the opening line of this track and from what I’m hearin’, my answer is “PAAAAAAARTY”! With Lionel wailin’ away on the violin, John squeezin’ the hell out of the accordion, Gary LaDuke making various noises on various percussion type things, and Dan blowin’ hell through the holes in the harmonica, it’s sounding a lot like Fat Tuesday in my house. “Nothing Can Take The Place Of You” and nothing can take the place of good, slow blues. This beautifully done ballad’s filled with whispering rhythm, delicate harp tones, mellow guitar notes and wonderfully soulful and emotional vocals. The slow dancers will be in heaven with this one. This time it’s Merriam with the explosive voice on a track called “Dynamite”. It’s one of those head bobbin’, toe tappin’ shuffles that just reeks of blues. 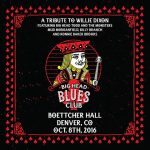 Gary and Mike are in the right spot rhythmically, the guitar leads smoke, Dan’s blowin’, suckin’ and even grunting on intense harp leads and while that’s all going on Merriam’s belting the hell out of the blues. So much music – so little time. I never wanted this one to end. 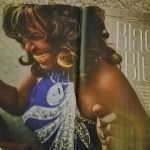 If “Ernestine” knows what the hell is good for herself she’d better heed Erica’s advice and find her a man of her own. As mean as this vocal whooping is sounding I wouldn’t want to be her if Erica gets physical. Damn girl, you’re belting the hell out of this one. Dan and Michael are also all over this one with the harp and guitar as well. Great stuff! The Latin vibe of “Love Knot” makes this another good one for the dancers….but you’d better have the moves, ’cause the song sure does. The smooth guitar and harp chords and the relaxed rhythm on the bass and drums create the perfect background for Gary Flori to work his magic on this tracks’ percussion. Once again, Merriam’s magnificent vocally. In a word association exercise the words “Wang Dang Doodle” would most likely draw responses like Koko Taylor, Willie Dixon and Howlin’ Wolf. And rightfully so! However, responding with Merriam Johnson, Dan Treanor, or The Afrosippi Band, shouldn’t sound so far fetched… especially after you hear this version. It’s a classy rendition of a classic song with Merriam, along with superb backup, doing a stand up job on the lead vocals. Other tracks on “Tangled Road Again” – a sure contender for the 2013 Blewzzy Award – include: “Tell Me Daddy”, “I Want Love”, “Bridges”, “Your (sic) Going to Miss Me”, “3 O’Clock In The Morning”, “Love Is Just For Fools” and “Give Me My Roses”. You really should check out Dan Treanor atwww.dantreanorband.com. There you’ll be able to learn a lot more about this interesting man, purchase some CD’s and tell him his buddy the Blewzzman sent ya. ← Rootstime Magazine in Belgium Loves Tangled Road Again!